If you've been following my blog for any amount of time, you have probably heard me going on and on about my star-flower quilt along quilt. I've been working on it since mid-summer. I'm happy to say that it is finally (FINALLY) done. Pieced, basted, quilted and bound. I don't think I've ever been happier to finish a quilt. I'm calling my quilt "star struck". It measures 66 inches by 72 inches. The fabrics are Happy Go Lucky, by Bonnie and Camille, some Avalon, and a few other stash fabrics that I had on hand. The backing is Aqua Kona Cotton. The back was pieced with the remaining diamonds from the top. I included a few tiny stars made from the little scraps left over. I love it. I free-motion quilted it using stacked lines within the stars and stippling everywhere else. I am hooked on free-motion quilting now. And it doesn't scare me anymore, so that's something. It was bound in a red and white bias print from the "Scrumptious" line by Bonnie and Camille. I need to get more of this print. It is so pretty. - Take the time to fix your mistakes when you figure this out, even after your quilt top has been sewn together. - Don't be annoyed when your family asks for dinner.... Again. - Remember. It's just a quilt... Not brain surgery. No one will die (or even notice) if you make a mistake. Hopefully. - When you've put upwards of a hundred hours into a project, savor every stitch of the binding. Revel in it. You are almost there. - When free-motion quilting, periodically re-tighten your machine foot. Apparently they can wiggle loose. - When doing that, try to remember not to show up at the school looking like you've been hiding in a cave for a year with thread in your hair. - Do your best, not someone else's. - Know when to give up on an idea if you just don't like it. Don't be afraid to take time and re-evaluate. - Acknowledge that your quilt will not be perfect. BUT, it will be perfect for you. - Bury your thread knots as you go. - Know when to take a creative "break", but remember to come back. - And most of all ... don't give up. 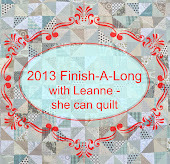 Linking up with Amanda at Crazy Mom Quilts for finish it up Friday. It's been a bit of a while since my last post. Our home has been hit by one nasty cold after another, circling our family (with the notable exception of my husband) not twice, but three times. That being said, I've still managed to sneak in moments of craftiness. Today I'm sharing a bag I've made for a special cousin of mine. I've made a lot of bags in the last few weeks, prototypes for a business idea I'm playing with. But this one is special. For as long as I can remember, my cousin's favorite color has been green. Always. When she indicated she might like a bag of her own, in green, I knew exactly which fabric to use. I had some V and Co. green ombre and decided to set it off with a Robert Kaufman chambray. For the size/style of the bag, I used Anna's (AKA Noodlehead) tutorial for a wide-open pouch in the large size. I pieced the design to play with the values in the fabric and to give it a fresh, clean-lined feel. I then customized it to add fusible fleece and quilting. I quilted it in a lovely blue/green thread to add dimension. I love how it turned out. On the inside I used a fun geometric print. For one of the tabs I added (not in the tutorial), I found a darling little bit of ribbon at a local fabric store. It seemed to be perfect for this bag. The green in this bag is so fresh and "springy". It was so fun to design something with a specific person in mind. I really hope my cousin likes her bag, even half as much as I do. Now that it's had it's moment in front of the camera, it's off to New York. And I'm off to my sewing machine. 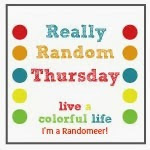 Linking up to Amanda at Crazy Mom Quilts for finish it up Friday. Alrighty folks. Brace yourself. This is one of those embarrassing moments (somewhat akin to discovering your skirt has been stuck in your pantyhose, or maybe like having someone drop in on a definitely not company ready house). This is me, laying out my work-in-progress items. Feel free to gasp, sigh, or turn away disgusted. It's ok. I'm leaping into this Q4-FAL late, having only just heard about it, but I think it's a fantastic idea. What better way to hold yourself accountable, to actually finish something, when it's all hanging out there for everyone to see? 1. This is a romper, in progress, for my neice. Its for next spring/summer. Those of you following my blog will be familiar with it. We are just over halfway there. I love these stripes. 2. This sweater was started last year. It's my "Low Tide" from Tin Can Knits. I love it. I have had it almost done for too long. My progress came to a halt, roughly around the time I realized that it wouldn't fit me pregnant. (Ahem. Long story. Roughly 9 months long.) Anyhow, it fits me now. If I could only carve out the time to sew in ends and put buttons on. On a side note, beware of art projects covered with glitter. Knits will stick to them. And require washing, and re-blocking. Again. 3. This one has been in the works for a year and a half. Two Mays ago, for our ten year anniversary, I stumbled across some beautiful nautical prints and thought of my sea-obsessed boy. He's been patiently waiting for me to get my act together. We'll be making the Fireworks pattern from Thimble Blossoms out of this sweet stack. 5. This is one of my oldest projects to complete. It is a low volume quilt (before I ever knew what that was) made out of really sweet fabrics. In retrospect, I should have chosen better quality fabrics, but live and learn right? It's too precious not to finish. It just needs time. And a few good movies. 7. This quilt (or box) is a surprise quilt for my daughter. I make all my children surprise quilts when they go to Kindergarten. I'm using Aneela Hooey's Walk in the Woods line. Its so fun to work with. 8. Next in line is my "Swoon" quilt. I'm either two thirds of the way there, or halfway... haven't decided yet. But either way, it's going to fit my king size bed. I cannot wait for this to be done. 9. This next one is near and dear to my heart. It's my Star Flower QAL quilt. I love it. I love it so much. I love the colors, the retro feel... it's just SO happy. I anticipate this one being done first. 10. Somewhat recently, my husband started dropping hints. Really, really big hints. Then he asked for a quilt. I almost fell over. He has made no indication of wanting anything handmade by me in the past (not being a sweater person, and such). The only stipulation was no pink, purple, or flowers. So, I went shopping. I love all of the finds for his quilt. It will be one of my own designs (loving this aspect especially). You can see a tiny bit of the beginning of this quilt on the bottom of the stack. I have a lot of work still to do, but since it's a "surprise" quilt, I'm limited on when I can quilt it. 12. These are socks for my oldest. He LOVES my handknit socks. So I try to make them regularly. If only his feet would stop growing. The yarn is fantastic - it's a self-striping yarn by Turtlepurl Yarns. I'm still in the swatching stage, but I anticipate these to be a quick knit. 13. This is my Cotton Blossoms quilt. Apparently I fell in love with Bonnie and Camille with their first line of fabric, long before I knew who they were. I saw it at a craft show and had to have it. I've been working on this for too long and am dying to see it finished. It's the perfect season now too for the colors - all those lovely rusty oranges, and creams, and blues and greens. 14. This little container of fun is hands down my oldest WIP. I started this back when my oldest was a tiny baby, making this about 7+ years old. I was just learning to quilt, and had so many issues with figuring everything out. At one point I undid every block and redid it and backstitched the ends, because I was worried it would unravel (I have learned a LOT since then). I made this with less than stellar fabrics (back in the days when Walmart sold fabric) and I know it won't last forever, but I need to finish it on principle. I have already spent so much time making it, and the backing is sitting there waiting. So, it's time. 15. And we've reached the final one. This is an ambitious quilt I started soon after I started number 14. (The farther I get from my first quilts, the more I realize how ambitious I was when I started out. One day I'll show you my first quilt.) This quilt is foundation pieced, and I really do love it. I've outgrown my love for batik, but the colors are so beautiful, and I know just the perfect person to gift it too, when I'm done. I know this list is huge. But, what can I say? It would seem I am still ambitious. Even if I only get half of it done, I would be ecstatic. So, it's shaping up to be a busy few months. Just the way I like it. Today's project is something I've been thinking of making for a LONG time. It could even fall under the category of "necessity". My daughter has needed a bag for our congregation meetings so she can hold her books and pencils and pad for a long, long time. She had been making do with a little purse I had made her when she was even tinier, but it could only hold a small amount of things, and they had to be small things, at that. There is a distinct shortage of bags out there for children that are not heavily branded with logos and cartoon characters. I've been mulling over HOW to make this bag for awhile now. I knew it needed to be versatile, tall enough to handle large notebooks, have pockets, and be able to go with most outfits my daughter would wear. I'm really annoyed I didn't find any solids that were pink or purple in my stash to incorporate, but I think it turned out well, regardless. And of course she found the only bit of pink in the bag. After reading up on a few basic bag making pointers, I went to town. This was such a fun challenge. More and more lately I find I'm letting myself design things without patterns. In the old days, I would have been unable to make this without a pattern firmly in my grasp. There were a few trial and error moments, but for the most part, it came together perfectly. I wanted the finished product to be quilted. I chose a light aqua thread and did some improv straight-line quilting. For sturdiness, I used fusible fleece. And for the inside pockets, I used a heavyweight interfacing. I made the pocket with four different colors, to add a little extra zip to the inside of the bag (as though the lining weren't enough). Another favorite feature is the handles. I LOVE them SO much. Probably the hardest part was lining up the offset triangles to make the chevron. If I were making this again, I would use a different method to do that. I suppose the upside to abandoning my pile of WIP's to make this is that it's finished. I think it should be called "Seasons". It's a little bit of fun, a whole lot of color, a tiny bit of art, and best of all, practical. My job is done. And my daughter loves it. I'm happy to report that with the exception of some borders (awaiting the last step in the tutorial), this baby is done. I will focus on my backing piecing next. I love absolutely everything about this quilt. It's bright and happy and every single star has polka dots. It's definitely been worth the effort. The hubby has dropped the hint that maybe I should work on his "not quite a surprise" quilt while I am waiting for the tutorial. Sounds like a perfect plan! Linking up with the always inspiring Amanda at Crazy Mom Quilts. It's here. Finally. Autumn. I can't begin to tell you how much I love autumn, and everything that comes with it. After what must be six months of flip-flop wearing, it's time to break out the boots, and socks. The kids are back in school and settling into a routine of early mornings and early bedtimes, snacks and homework, and of course, books. There is a certain magic to that moment in the day when I have the house to myself and my baby is snuggled up having his nap. And I can think. In quiet. This is when the sewing happens. This past weekend found us in Victoria. It was the first time on the ferry for two of our children and they loved it. They especially loved getting up "in the middle of the night" (5:00 AM), and beginning our journey with the sun rising over the water. Our first mission of the morning was hitting not one but two fabric shops and a yarn store. My husband has clearly decided to embrace the inevitable as he suggested we do this first. The first shop we found was "Avenue Fabric Studio". I had heard about it from Allison Harris's blog, Cluck Cluck Sew. She will be coming up to Victoria to do a weekend workshop, featuring her quilt pattern "Suburbs". The shop is new, and the owner, Vivian, is absolutely charming. She opened her door early to me (I got there 40 minutes ahead of opening - craft shopping is one of the few times I am ever early), and upon hearing that my troops were out in the truck, went out and invited them in. This is not a quilt shop, she explained. It's a sewing studio, a community gathering point. It's a place where people can come to sew by the hour on one of the shops many machines, to sit and stitch by hand, and where parents and children can learn crafts together. It's genius. There are workshops and other amazing creative things going on in there. And, of course, there is fabric. I found a wide assortment of lovely prints from various designers, all reasonably priced. I even got my hands on some lovely Anna Maria Horner Hand Painted Garden, and a Valorie Wells Wish fabric. It was an excellent start to the day. Next up was Satin Moon. This was also fruitful. The sale section had some lovely modern fabrics that were clearly just waiting for me to find them. I can honestly say that I have never seen a yarn store quite like the Beehive. It is a traditional stop for me on every trip to Victoria. I have never walked out empty handed, but am usually toting at least one new project, pattern, and a whole bevy of ideas. This time was no different. I came out with a stack of yarn, some for socks (the kids will be asking soon), and for a couple shawls/scarves. I think what makes this shop different is the fresh and new displays of projects and accompanying yarn. For some reason, my creative juices go haywire at the Beehive. I could not stop thinking about this one pattern and was worried that if I didn't go back, I'd never remember what it was. I ended up swinging by again on our last day to scoop up the name of a pattern of shawl (Color Affection) and the yarn that was clearly meant for it. I cannot wait to cast on. I'm valiantly trying to exercise a tiny bit of self-control and finish what's on my needles first. But it's something to look forward to. Back at home now, and settled into the routine again, I'm desperately trying to finish my star quilt top. I have two rows left to seam together. This sounds easy but it is a series of starts and stops as you go in a y-seam pattern all down the joins. It takes quite a bit longer than a normal seam. But it will be so worth it. And quite honestly, y-seams no longer scare me. Today's finish is a somewhat unexpected project. It just happened. This just might be the best kind of starts and finishes. My niece, owner of the quilt in this post, has a mother that is a baker. (This, by the way, is a dangerous sort of person to have in the family... calories seem to migrate this way much too frequently.) She is a wonderful sister-in-law, and to see her and my brother's family grow has been so precious. It occurred to me one morning, while snuggling my littlest, that the tiny little fingers belonging to my niece will soon be wanting to help her mama in the kitchen. And that means she needs an apron. And ... I just happened to have some leftover fabric from her quilt. I didn't want to go out and buy a pattern. It seemed like it would be a simple enough thing to draft my own and create it. Completely unexpected was just how much I loved this process. Within an hour or two, her apron was made with just a couple finishing touches left to do, the little bits that make it special. It is made in a toddler size, that could go up to about 5 or so. I took a couple shots of my daughter modeling the apron (as I don't have an extra toddler about), to give you an idea of size. This post is about family and growth and traditions passed on, memories made. We are so blessed to have the newest little hands in our family.